I titled this post Relaxed & Ready because that's exactly how my weekends tend to be. We keep things pretty laid back whether it's hanging out with friends and family, dining out, attending an outdoor concert or simply running errands. Regardless of what's on our agenda, I like to be ready. Ready meaning, getting dressed for the day just as I would during the week. As shallow as this many sound, both my mom and grandmother always told me to look presentable in public. Their piece of advice has stuck with me since I was little. Now, I am not saying there aren't some days when I don't get out of my PJs or throw on some yoga pants to run a few errands, but if I know I am going to be out and about for a few hours, I like to get "dressed". I feel better about myself, hold my head higher and am not mortified if I run into someone I know or haven't seen in awhile. And when I say getting "dressed", that doesn't mean I pile on loads of makeup, strut around in high heels or slip into a swanky dress. It means I put on clothes that I feel confident in wearing, doing something with my hair and applying a little makeup. You might be thinking that I am overly consumed with physical appearance, but for me it's about taking pride in the way I carry myself. Plus, you never know who you are going to run into. In my opinion, it's best to be relaxed and ready instead of running like the wind to duck behind a rack of clothes at Target when you see someone you know. In typical Thursday fashion, I am once again sharing a look that I posted on Instagram. It isn't anything too fancy, just an easy, affordable style we can all wear no matter our age or body type. This is my take on getting "dressed." What's yours? At the end of the day, whether you choose to wear yoga pants or a sparkly dress, having confidence in yourself should take priority. One lady that always seems to be have her "ready' game on is Carly from Lipgloss and Crayons. She and I have actually become great blogging friends. Her fearless fashion, fun beauty tips and sharing honest life lessons are a few things that I love most about her. And I have never told Carly this, but I have always thought she could be Jessica Beil's sister. I swear I think they look so much alike. Carly is a school teacher (a super fashionable one) and has even offered some behind the scenes "teacher" advice for my own second grader. Her compassion for others is hard to find these days. And we have even shared a few secrets with one another, ones that make this whole blogging thing all worthwhile because of the genuine friendships that come along with it. I mean just look at her, stunningly gorgeous. If you haven't had the chance to meet Carly yet, I encourage you to get yourself over to her place immediately. Whether it's to gain some fashion inspiration or to learn a few lifeisms, she will keep you coming back for more. This is one loyal lady, I can promise you that. Oh, another reason Carly and I get along so well, she loves some Forever 21 too. In fact, she is giving away a $25 gift card for you to shop. I might just have to enter this giveaway myself. Good luck and make sure to tell Carly hi! I absolutely love your outfit!! Love the green shorts and the black and white top. It's simple but classy!!! Very pretty..
Oh I love Lipgloss and Crayons! Carly helped me out when I first started blogging! Love the black/white/green color combo! It really is true that you never know who you may run into. 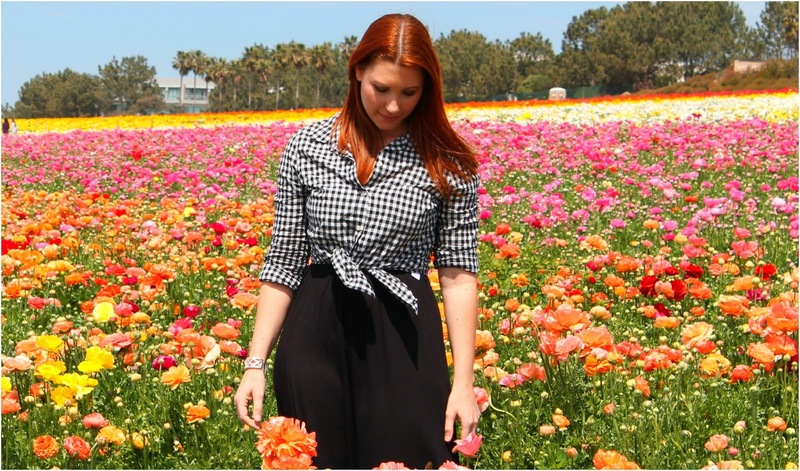 That photo of Carly in the field of flowers is so pretty! Those green shorts are lovely. I agree, one should always look presentable. I have been searching high and low for a B&W chevron top after I saw you wearing this amazing outfit last week. I am so happy you recreated your look and I was able to snag the top from modcloth! I love your blog and appreciate all you do! Love this recreation Shanna! I also completely agree with feeling good about yourself outside of the house. I always try to be "done" looking when I leave, even if it's to hang at my parents house on Sundays. I love your take on getting dressed. I need to practice this more often, because I swear whenever I risk going out to the grocery store with sweats and a ratty t-shirt I always run into someone I know. Your mom and grandma gave you great advice. An old ballet teacher of mine told me once, "You will dance how you feel and if you look like crap you will dance like crap". SO I would always wear make up to dance class, but not in real life lol. That always stuck with me and I'm not sure our clothing is a direct representation of how we are feeling at that moment, but I don't think putting a little effort into an outfit and looking good can hurt! I totally agree with you...I think people should try to look presentable when they go out in public. Of course we all have our days, but I think it makes you feel better when you try to look your best! Super cute outfit, Shanna!! Such a pretty outfit! Love the orange and teal combo. You're so right, being comfortable and confident is what really matters and taking extra time picking the right outfit will make all the difference! I loved this Instagram pic! Green, black, and white are a favorite color combo now! Love your outfit! I especially love the color of those shorts. So now I have to go to Target and get those shirts. My husband will not be happy about this. Lol I love this entire outfit. agreed, i like looking presentable in public- although I admit I don't always! love this pretty, casual look! I am the same way! I feel so much better when I'm dressed and I always like to he ready to go put and do something but relaxed at the same time. Love those green shorts! I'm the same way too. I don't leave the house not liking what I'm wearing, whether it's a dress or some casual shorts and a tee. It's true, you never know if Ryan Gosling might be in town and you run into each other, right? Or is that just my dream? Love the chevron top, I think it's so cute! Spending all day in an outfit you don't love is the worst–and it always makes me grumpy haha! I'm loving this chevron top! I seriously love those green shorts! I love your outfit! Chevron and mint? Yes please! I'm also loving those sandals. I love this look! Those sandals are so cute! I have to admit that when I take my son to school I don't have on make-up but throw on some sunglasses so people can't see my scary face. Yikes. I must agree that I feel so much better about myself when I put in a little effort! I just wrote about it today, actually. I have been feeling sick lately, but putting in some effort into my appearance helps me to feel a little better. I could just run around town in yoga pants (which is definitely what I change into when I come home!) but instead I chose some skinny jeans and a comfy tank. I may feel gross on the inside but you would never know it on the outside. It's the magic of clothes! I am SOOO in love with this outfit!! I think I need some green shorts now! LOVE those shoes! I love getting dressed. It's just as easy to throw on jeans and a pretty top as it is to throw on sweats and a hoodie! I'm def guilty of running around my town in yoga pants AND a bare face. I live out out of the way and I'm quite certain I won't run into anyone I know. So far anyways! But I get what you mean about just feeling better about yourself when you are "dressed." It's a nice confident feeling. I love love your look!! I have always been taught to dress to impress. you never know who you will run into so make sure if you presentable!! Love those basket weave sandals! They look like they should cost far more than $20. My husband always makes fun of me because I will never leave the house in sweatpants, even if we are just running to the grocery store. It only takes a moment to throw on jeans and a top. Looking presentable is important in my opinion! You're adorable! Love reading your blog! I have always been taught to be put together when I walk out the door, and I never regret it! Especially in the Target in my hometown, where you can't go without seeing somebody you know! P.S. LOVE those green shorts! Love your outfit today. That chevron top is gorgeous. Love it!!!! I completely agree with what your mom and grandmother said. I always try and leave the house feeling good about myself and making sure that I look my best. Seriously loving kelley green right now. This is so cute! If I'm going to be out for a few hours, I'll get dressed. If not, yoga pants it is! I hate being uncomfortable or feeling like I'm not dressed appropriately. okay honestly. This outfit. Probably one of my top faves ever of yours. 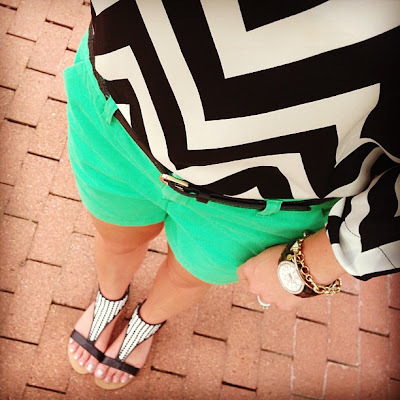 Love this chevron top with the bright green shorts! I've been enjoying wearing my bright colored and patterned shorts this year too! Love this outfit. Great colors and I so agree with you about always being dressed. I do the same thing and always have. Hell, I still get dressed for flights. Shanna - I could not love this combo any more! The chevron top with the shorts is so perfect. Might have to add that top to my closet!! I feel the same way you do about getting dressed. I just feel better and happier when I look "put together". I have those shorts already. Now I'm going to have to get those shoes and shirt! Love you and your blog. I understand what you mean about appearance. While we should never judge based on looks, the fact is that how we choose to present ourselves will say something about us. For example, I could understand not putting on make-up just for a trip to the gas station, but I wouldn't go there in just a bath robe (I've seen that!). I love everything about this outfit. I want to buy all of it.